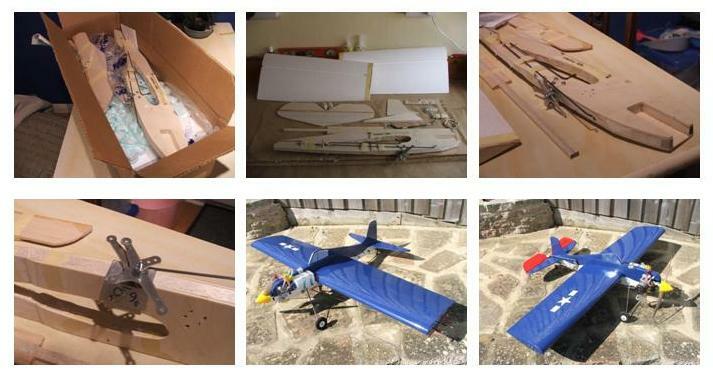 It seemed too good to be true – a kit with all the hardware, foam wings and ready-cut fuselage for £37? That’s exactly what I found while trawling eBay. With postage from the USA, I paid a total of £50 – the box that arrived from Joe Just (a Brodak dealer) and its contents are shown below. It wasn’t a just a “one-off” – Joe makes these to sell to anyone that wants one, via eBay or mail order. It was my first foam wing ever, and I was amazed at how easy it was to build. The kit contained just about all the hardware you need: bellcrank assembly, pre-bent landing gear (with mounts) and arrestor hook, lead-out wires and crimps, throttle and elevator pushrods threaded for the Sullivan quick-links included, elevator horn & hinging material. All necessary holes were pre-drilled. The ply doublers were already glued to the balsa fuselage core, and the foam wings came sitting in the matrix from which they had been (very accurately) cut. A full set of instructions was also included. All I needed to supply were wheels, covering material and of course an engine & tank. The build went pretty well, with just a bit of fettling needed to the wing-hole in the fuselage to get the wing fitting nicely (about which Joe advised about in the booklet). I made a couple of minor changes, to the elevator linkage (moved to the top surface of the tailplane), and the addition of various means of adding weight to the rear fuselage and onto the outboard wingtip. Ironing the Oracover onto the foam was no problem – the foam was able to take quite a serious amount of heat where necessary. I’ve just test-run the MVVS for the first time (it’s a nice strong runner) and made up a set of lines – I now just need to set up the carb for slow running before the first flight. (Later…) downloaded the Perry Carb instructions from their website – no wonder the idling was non-existent, there was no air gap at the edge of the barrel when the throttle was closed! Doh! (ADDED 8th JUNE 2012): So how did she fly? After simplifying the fuel system (back to a good ‘ole Brodak stunt tank fitted close behind the engine) we finally got airborne at the Westland Helicopters airfield at Yeovil (I work there) early in June. She leapt out of the stooge, lifted off from the short stretch of tarmac after about 10 feet, grooved nicely through a strong easterly for the hi-speed segment at about 75mph, throttled back pretty well (still some adjustments to do on the Perry carb) and endured a deadstick landing resulting in a pitchpole (yachtie-speak for an end-over-ender!) on the very rough grass, but no damage. Very pleased with the model, an excellent introduction to the breed: as the kit-supplier Joe Just says, she may not be a hot contest winner, but great for a rookie like me to practice with – thanks Joe!